Apple misses no opportunity when it comes to flaunting how seamlessly its self-made hardware and software works together. So much so that the Cupertino giant launched a bunch of TV ads a few days back with the tagline ‘If it’s not an iPhone, it’s not an iPhone.’ And today, Apple is taking things up a notch, and has launched a new ‘Why there’s nothing quite like iPhone’ campaign on the Web, focusing strictly on the major selling points of its smartphone while also taking subtle jabs at the competition. 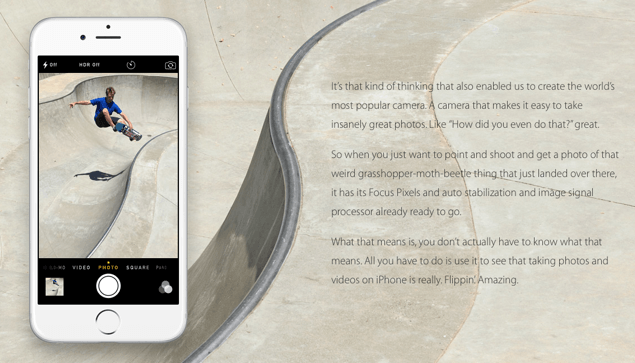 Apple’s new Web campaign, which can be viewed in all its glory on the company’s own website, is divided into a bunch of sections, focusing on different features and capabilities of the iPhone and of course, iOS. With ten pages in total to gawk at, it’s very clear from Apple’s new marketing move that the company is not resting easy on its laurels and plans to push its hardware and software further in a space which is already crowded with millions of devices worldwide (read: fragmentation). Apple highlights features such as the Camera app in iOS, and of course the camera sensor itself on the iPhone, and claims how its smartphone is capable of taking great shots with complete ease, allowing user to focus on the task of taking photos rather than nibbling around for that perfect setting. Then there’s the App Store, the hub to extend the capabilities of Apple’s already great mobile software. 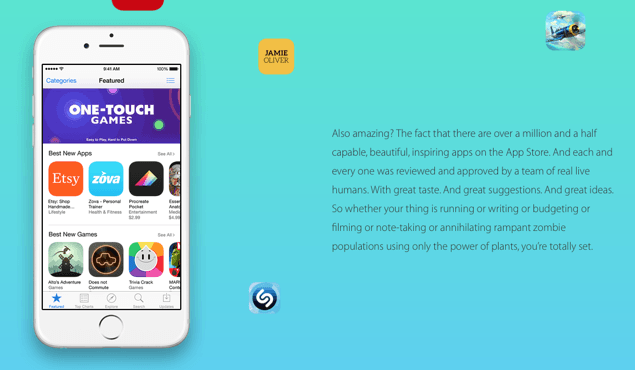 The Cupertino giant claims that it has now well over a million and a half apps, which are “approved by a team of real live humans.” What does that mean for the user? Simply put – quality. In its campaign, Apple takes a swift jab at the competition stating that it is more secure than anything else out there, but we our reservations on that claim. The company mentions malware, and how its mobile platform is secure down to the core, so users can rest assured that their private data won’t end up someplace unsafe. The entire campaign is carefully laid out, and ends with a straight up notion asking the user if they want to jump ship and get onto the iPhone bandwagon. 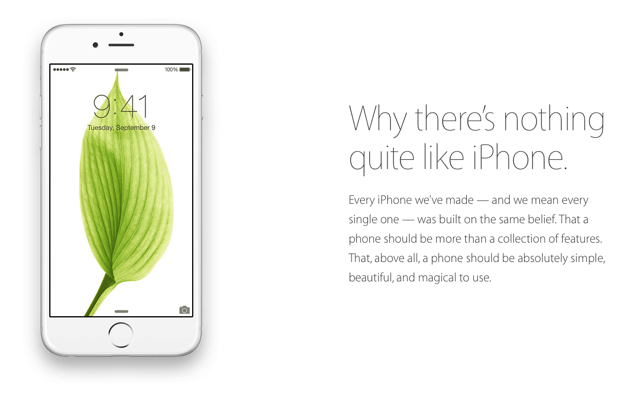 We’re not sure how many people Apple would end up converting, but still, bold claims all around. 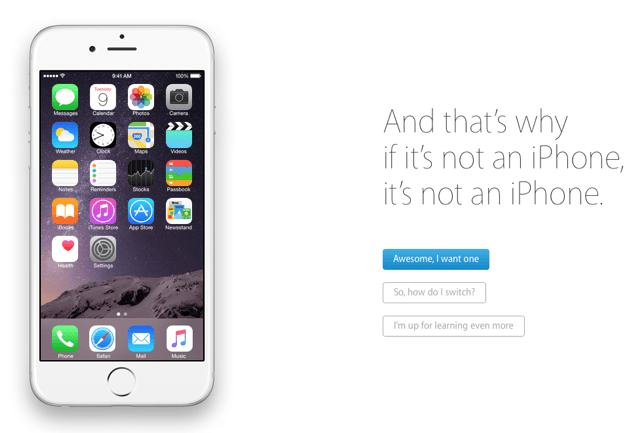 You can check out Apple’s ‘Why there’s nothing quite like iPhone’ microsite by going to this link. With big claims all around, it would be interesting to see how things will move forward when Apple takes the wraps off its big next-gen release, the iPhone 6s. Rumored to be announced at a special media event in September, the device is said to be faster, and will incorporate a bunch of new features, with a Force Touch display being one of them.